Sure was nice to see it all come together this past Friday night against Lexington. It was a total team effort, and an outstanding performance from junior TB Tre Simpson as the Riders won going away, 41-21. We'll talk more about that, some recruiting news, a look at Region 14, and check in on Rider alumni playing college ball. A mega post in honor of a mega win. Fans brought the noise, plain and simple. First time in quite a while..but in their defense, this may have been the first time all year that we saw something to get excited about. The kids fed off that for sure. The offensive line deserves a whole collection of skull stickers for their performance Friday night. They manhandled Lex's D line and got Tre into the second level all night. It was said coming into the game that all you needed was a D1 offensive line and the reigning Mr. Football (like N. Canton Hoover & star back Erick Howard) to run on Lex. I think Orrville proved that theory very wrong. For all the yards Tre racked up on offense, his best play of the night may have been on defense. Right after an interception killed Orrville's first drive of the 3rd quarter, Tre stepped in front of a Courtnet Avery pass and gave the ball right back to the Riders, who would punch it in the endzone a few plays later. That swing was a big momentum boost for the home team. Here's the pics from the game courtesy of Scott Ferrell Photography. Enjoy, share, download...just remember what it costs (nothing). I think picture #74 is the play where Lexington senior Shaquille Jefferson was injured. Last I read he suffered 3 torn ligaments (out of 4) and dislocated the knee joint. Tough injury and I'm sure an even tougher recovery. Really felt bad for the young man. As a father, I'd feel completely helpless watching my child in pain like that. I'm hearing chirps that a scout from Indiana University was at the game Friday night...and happened to have a front row seat during Sam Miller's diving TD catch in the first quarter. Apparently, they have their eye on Sam and were also talking to Chase Hoobler. How will that affect Chase's verbal to Akron, time will tell. National signing day isn't until Feb. 2010. I don't think I'm the only one thinking this, but it felt like the season, not just the game, was turning around during that dominating 3rd quarter on Friday night. Rider players, coaches and fans knew we needed that game, but beating a solid Lex team was easier said than done. Lexington will win most, if not all of their remaining games....but they just weren't as good as their 2008 squad that went 11-1 and lost to eventual state champ Sylvania Southview. Our kids figured that out and their play only got better as the game went on. It's fun to think about how good we have the potential to be. With back to back solid rushing efforts, we seem to be morphing into a team that is just as confident running the ball as we are passing the ball. This, along with a defense that is getting better by the week, makes the prospect of playing the Riders a very scary one. But, as always, last week means nothing. You have to go out and prove it again for another (hopefully) 11 weeks. The Riders are back from the basement of the region, currently residing in 7th place after being 22nd after the 0-2 start, and less than 1 point from sitting in 2nd place. Check out the up to date standings by clicking on the "OHSAA Region 14" tab at the top of this page, right under the site logo. OCC couterpart Clear Fork is currently in 2nd place after a strong 3-1 start. They will look to solidify that position with a win over Lexington this Friday. If the playoffs started today, the Riders would travel to Clear Fork for a first round game. The week 9 game between the two could hold a ton of computer points for the winner. The region's only private school, Elyria Catholic, is currently in 9th place. They're 3-1 but their 3 wins have come against teams with a combined record of 1-11. Only 3 teams in the region have yet to win a game...Otsego, Upper Sandusky and Rossford. County teams Triway and Norwayne are currently 13th and 22nd respectively. At 2-2, Orrville has a higher ranking than 6 teams in the region that are each 3-1. The 5th ranked Genoa Area Comets are 4-0 and have only allowed 7 points all season, while averaging 57 points per game on offense. 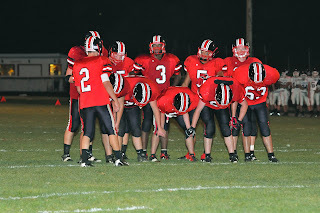 Their 2008 started in similar fashion and ended in week 14 with an 8 point loss to eventual state champ Ketteirng Alter. They have lost 1 regular season game since the start of the 2007 season. Region 13 leader Chagrin Falls leads all D4 teams in computer points after week 4, checking in with 9.45 points. Not a whole lot of noteworthy goings on here. Tim Hiller led WMU to their first win of the season over Miami. Tim's 4 TD passes (in only 3 quarters of work) in the game gave him 82 for his career, 18 shy of the record held by Chad Pennington. Central Michigan's Dan Lefevour is the only other MAC QB in striking range of the record, he currently has 77 career TD's, but does have more career passing yards than Tim (9995 to 8790). Tim is currently 11th on the all-time MAC passing yards list, while LeFevour is 7th. The MAC record for passing yards in a career is 11903 set by Byron Leftwich. Ohio Northern lost to Mt. Union 30-10, the game was tied at half, but Mount pulled away in the 2nd half. Kyle Simmons and the Polar Bear offense struggled to break 100 yds. of total offense for the day against the kings of D3. Lastly, if you notice the top of the page right under the logo...the "info bar" as I like to call it, you;ll notice a new section called "College Riders." My goal is to make that space a clearing house for all Orrville alums playing college athletics of any kind. The football and basketball athletes will be fairly easy to find and track, but it's the smaller sports (at least in terms of coverage) that will be more difficult to moonitor. I'd like to at least include a link to the athlete's bio at their particular college, and if that's not available, just a link to the homepage of whatever sport they play. I know I may be missing some...and if you're aware of any others, please let me know. Either use the "contact" tab in the info bar, or just leave a comment in this post. Yes...thank you. I'll add to the list. What about the Howard sisters? I thought they were running track at Akron U. In looking at Akron's women's track roster, I see neither of the Howard sisters. Maybe someone can give an update. Thank you twice more....got the list updated.